As the year is winding down, we have an offer for you with which you can start into your digital future more quickly than usual. With our Speed Digitization package we will make your business’s sales and project management more efficient in only two steps. You will receive both software licenses at a special discounted price and comprehensive technical support from proMX during the implementation of the solution in your organization. This is an offer for professional services and manufacturing companies, our two focus industries. You get licenses for Dynamics 365 for Sales with proRM Fast Start for project management at the special price of only €52 per user per month. Subsequently our experts will support you (mainly remotely) with implementation, depending on the size of your company for either five or 20 days. If you want to make 2019 the year in which you take the first step towards becoming a digital business, this offer is ideal for you: Get yourself a modern, inexpensive solution, have it implemented by experts in no time and also receive trainings for your team! 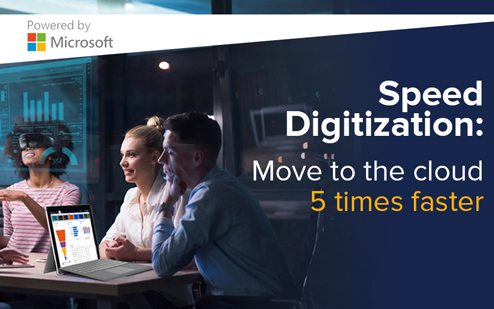 Benefit from our Speed Digitization offer and make 2019 your digital transformation year!